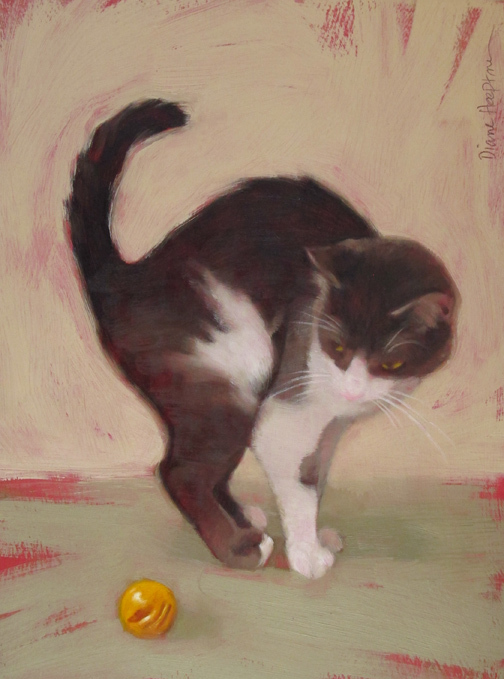 That little yellow ball's about to go flying, me thinks. Most of you know, my kitty models can be found at the Cleveland Animal Protective League. If they aren't already adopted, they are waiting for you! I am so fortunate to be able to acquire my reference photos there. This week, the APL posted a wishlist on Amazon. They need everything from pet carriers to cat toys... If you are inclined, have a look and make a wish come true. 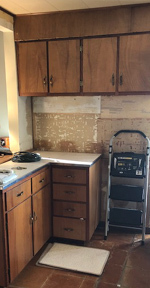 My kitchen renovation continues. Walls and floor are bare! New counter tops measured for... New floor soon. I'm saving some of the budget for lighting and most likely an electrician to insure I don't burn the house down with said lighting. :) Picture included. We removed a small built-in desk (where the ladder is) to make room for a water dispenser... Fun, fun. I love the more impressionistic treatment....the brain "sees"the movement. Wow,that kitchen was a time machine!Great job!